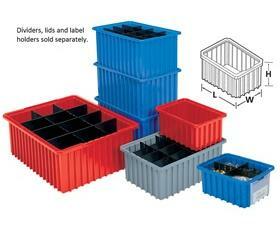 Intersecting dividers allow the container to be subdivided in separate compartments as small as 1-1/8" sq.&nbsp; Injection-molded from high density polyethylene -- resists most solvents and chemicals.&nbsp; Compatible with most racks, shelving and automated material handling equipment.&nbsp; Available in Red, Blue, or Gray -- please specify.&nbsp;Dividers,&nbsp;lids and&nbsp;label holders sold separately.&nbsp;&nbsp;FOB Shipping Point. 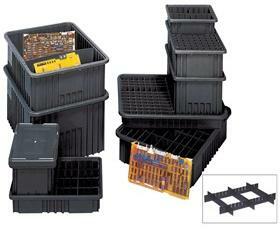 <B>Heavy Duty Snap-On Cover</B> - This durable cover snaps easily and securely onto the container. 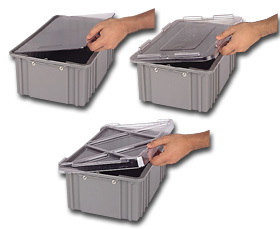 Available in Solid Gray,&nbsp;XL BLack, Light Blue, or Clear material for easy visual inspection of contents.<BR><B>Light Duty Cover</B> - This light duty cover sits easily on the container, protecting parts from dust and contaminates. 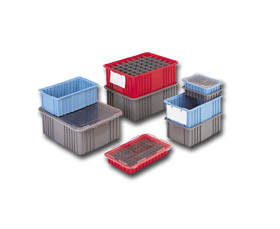 Only available in Clear PVC, it allows for easy visual inspection of contents.<BR><STRONG>Insert Cover</STRONG> - This cover fits snugly inside the container on the perimeter stacking ridge. Clear for easy visual inspection of contents.